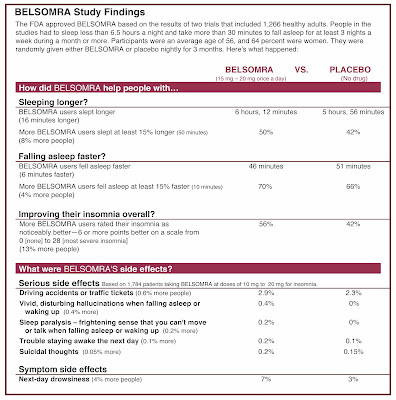 According to a Huffington Post Highline story (here), "During the [Belsomra's] development, Merck had suggested that it could treat insomnia more effectively and produce fewer side effects than existing medications. In 2012, one Merck scientist described the science underlying Belsomra as a 'sea change'." "Like the fuzzy animal commercial, the unbranded campaign for Belsomra told a compelling story about new developments in the field of sleep research. Older insomnia drugs try to induce sleep by making the brain more receptive to chemical signals that make people drowsy. Over the last two decades, scientists have developed an understanding of a separate set of chemical signals that make people alert. The WhySoAwake site gives a cartoonish version of this story, and a link on one page takes visitors to the Belsomra site, which explains that it is the only drug that acts to quiet the wake signals." But there is one thing the ads don't tell us. Namely, the FDA-approved, marketed version of Belsomra is not very effective. 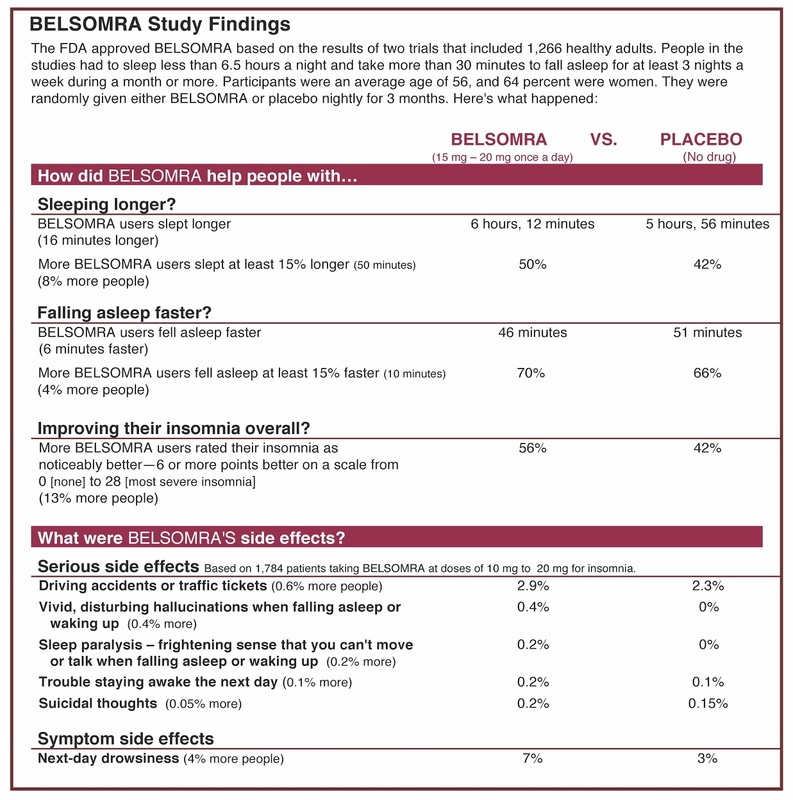 Consumer Reports advised consumers to stay away from Belsomra to treat insomnia for three main reasons: (1) It's expensive ($70 for seven pills), (2) has serious safety concerns, and (3) it barely works. In fact, because of the safety concerns, the FDA approved the drug at a lower starting dosage than the company had requested -- a dosage so low that a Merck scientist admitted it was “ineffective,” reported the Highline article. When Dr. Lisa M. Schwartz at the Geisel School of Medicine at Dartmouth saw the Belsomra ad, "she was struck by how smoothly it sidestepped the drug’s limitations. A soothing voiceover hypes the science, giving a sophisticated explanation of how Belsomra targets a neurotransmitter called orexin to turn down the brain’s 'wake messages.' 'Only Belsomra works this way,' the voice continues. The ad ends with the young woman curling up with the 'sleep' animal and falling into a peaceful slumber. 'You have no idea watching that ad that we’re talking about falling asleep 6 minutes faster and staying that way an extra 16 minutes—and that’s at higher doses,' Schwartz said. 'We really don't have a great idea of how well it works at the lower dose FDA actually recommends for people starting the medication'." “The FDA has set a disturbing precedent by approving an untested dose of a drug. For a deadly cancer with limited treatment this gamble might make sense, but not for a condition like insomnia and where Belsomra doesn't appear to work any better, or more safely, than available treatments,” said Dr. Schwartz who helped create a more informative, consumer-friendly label for it. Page 2 of that label is shown below. Find the PDF version of the full label here. Consumer Reports. Click on image for an enlarged view.